Two hours away from the smog and noise of Metro Manila, there is a raftable river, the Tiabo River, where paddlers can experience world class scenery and rapids for over 40 kilometers. The commencement of regular rafting tours on this Quezon Province river by Tribal Adventures allows interested rafters or kayakers to enjoy a true wilderness experience without having to travel very far from Manila. This river offers several trips: a 2-day trip begins with some wild rapids, including what is probably the highest commercially rafted waterfall in Southeast Asia (15 feet; can be easily portaged in high water or if guests want a more relaxing river experience). After about 10 km, the river calms down significantly, allowing guests to soak in the breathtaking scenery. Over night is camping on one of the many beaches the river offers. A one-day trip is also available on the lower stretches of the river, which, due to its mellow nature, allows eager paddlers to try kayaking as well as rafting. 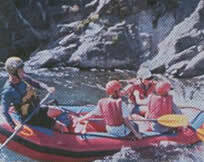 For more information about White Water Rafting on the Tibao river you can contact Tribal Adventures. Their website is http://www.tribaladventures.com.